The three-dimensional periodic nature of crystalline structures was so strongly anchored in the minds of scientists that the numerous indications that seemed to question this model struggled to acquire the status of validity. The discovery of aperiodic crystals, a generic term including modulated, composite and quasicrystal structures, started in the 1970s with the discovery of incommensurately modulated structures and the presence of satellite reflections surrounding the main reflections in the diffraction patterns. The need to use additional integers to index such diffractograms was soon adopted and theoretical considerations showed that any crystal structure requiring more than three integers to index its diffraction pattern could be described as a periodic object in a higher dimensional space, i.e. superspace, with dimension equal to the number of required integers. The structure observed in physical space is thus a three-dimensional intersection of the structure described as periodic in superspace. Once the symmetry properties of aperiodic crystals were established, the superspace theory was soon adopted in order to describe numerous examples of incommensurate crystal structures from natural and synthetic organic and inorganic compounds even to proteins. Aperiodic crystals thus exhibit perfect atomic structures with long-range order, but without any three-dimensional translational symmetry. and finally by the discovery of quasicrystals. modulated structures using the superspace approach. 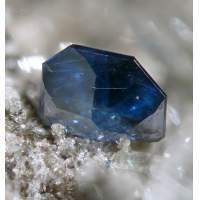 In nature, it is uncommon to find minerals which have strong and sharp incommensurate satellites that could be used for a higher dimensional refinement. Here we describe several cases of aperiodic minerals (natrite, calaverite, melilite, fresnoite, pearceite–polybasite, cylindrite) including the first examples of natural and stable quasicrystalline structures (icosahedrite and decagonite) which settle beyond doubt any questions which remain about the long-term stability of quasicrystals.